Verdict - Thackeray could have been a great entertainer with a more polished screenplay. Till interval Thackeray is actually and extremely engaging movie. It holds you with the director’s innovative ability to tell a story. Thackeray’s flashback story runs in black and white and establishes a clear mood of the grim reality of Mumbai and Maharashtra at that time when the local felt shortchanged. The movie drives on epic acting capability of Nawazuddin in those scenes . 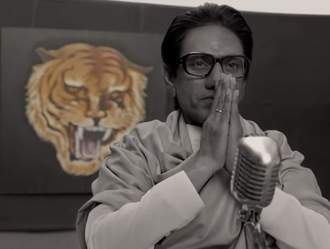 The movie is in fact brilliant when it unabashedly shows the confrontations between Thackeray and Morarji Desai and also his stand on standing up for hindutva. It in fact ends up competing quiet brilliantly with any dark gangster saga that even Hollywood would have to offer. The movie starts nose diving post interval and the curse of the interval ends up biting this movie to dust by the time it ends. It is like post interval the director developed some kind of a cold feet or was driven by some other forces and the movie loses its capability to hold you almost half an hour post interval and then you are looking at your watch repeatedly on when this one well end. The end of the movie is also its major weakness, the movie stops at the period of 1994 and thereabouts when Shiv Sena formed its first state government in Maharashtra and in one of its last scenes of creative flash we see Thackeray using a remote to control the TV reminding us of that famous statement he made in 1990s. Fact of the matter is Thackeray’s political career and engaging events continued way beyond 1994. However you can still give this movie a try for the pure joy acting of Nawaazuddin and the movies complete naked honesty till its last scene. Two stars for these two solid attributes, my only grudge is why could they not hire a better screenplay writer ?